Santa Strikes Back Video Slot Guide & Review - Casino Answers! Santa Strikes Back is a 5-reel, 25-line video slot developed by Realtime Gaming, featuring a wild substitute symbol, scatter wins, multipliers, two free spins features and a progressive jackpot. You can play the Santa Strikes Back Real-Series Video Slot at Bovada. Total bets on the Santa Strikes Back slot machine are $0.25, $0.50, $0.75, $1, $1.25, $1.50, $1.75, $2, $2.25, $2.50, $6.25, $12.50, $25, $62.50 and $125. 25 lines must be played at all times on the Santa Strikes Back online slot. You can speed up the game play by hitting the “Autoplay” button and checking off “Turbo Play.” You can manually skill stop the reels on Santa Strikes Back by hitting the “Stop” button in the middle of any spin you make. To play Santa Strikes Back, select your bet and hit the “Spin” button. You can win the Santa Strikes Back progressive jackpot by hitting 5 Santa wild symbols on a payline. The Santa symbol will substitute for all symbols in Santa Strikes Back except for the scatter symbols. At the time of this writing, the Santa Strikes Back progressive jackpot is at $11,430 and you can win it by playing Santa Strikes Back at Bovada! Santa Strikes Back’s scatter symbol is a Santa vs. Rudolph symbol. When multiple symbols appear on the reels on Santa Strikes Back, they will battle and whichever one is victorious will determine the scatter wins. If Santa is victorious, 2, 3, 4 or 5 Victorious Santa scatter symbols will pay out 2X, 3X, 20X or 500X your total bet. If 3 or more Victorious Santa symbols appear on the reels, you will trigger the Santa Strikes Back feature and win 7 free spins. During the free spins feature, Santa and Rudolph symbols will have a Candy Cane symbol in the background. When a Candy Cane symbol appears on a reel, it will light the Star at the top of that reel. If you light all 5 Stars, you will reset the number of free spins to 7 and increase the multiplier by 1. Stars will remain lit until a reset occurs or the free spins feature ends. The feature can be reset up to 19 times. Scatter symbols do not appear during the free spins feature. The progressive jackpot can be won, but cannot be multiplied. Free spins are played at the bet of the triggering spin. If Rudolph is victorious, 3, 4 or 5 Victorious Rudolph symbols will pay out 2X, 10X or 100X your total bet. You will also trigger the Rudolph’s Revenge feature and win 7 free spins. Prizes during each free spin are multiplied by 2X plus the number of Santas appear on the screen. Rudolph will triumph in all scatter battles during the Rudolph’s Revenge feature. The feature will re-trigger if 3 or more scatter symbols appear on the reels. The progressive jackpot can be won during the Rudolph’s Revenge special feature, but cannot be multiplied. Free spins are played at the bet of the triggering spin. Wins on different paylines are added. Compulsory 25 line play per spin. Santa and Rudolph will battle inside each scatter symbol when two or more scatter symbols appear anywhere. Scatter wins are paid for 2 or more Victorious Santas or 3 or more Victorious Rudolphs only. Scatter wins are multiplied by the total bet and added to payline wins. Payline wins are multiplied by the bet per line, except for the progressive jackpot. Highest win only on each line. Maximum win per paid spin, other than the progressive jackpot is 50,000X bet per line. Hit the “Autoplay” button to open the autoplay settings. You will be able to set the number of spins, set it to stop when the jackpot is won, stop if a win exceeds or equals (any amount you input), stop on any win, stop if your balance increases/decreases by any amount you input and stop once the feature is triggered. You can stop the Santa Strikes Back autoplay mode using the “Stop Auto” button to deactivate it. If you’re in the Christmas spirit or even if you’re not, Santa Strikes Back makes for an excellent video slot. The presentation is off the charts, for one thing. The slot game itself has got two free spins features and a progressive jackpot, so it’s got both sizzle and steak. 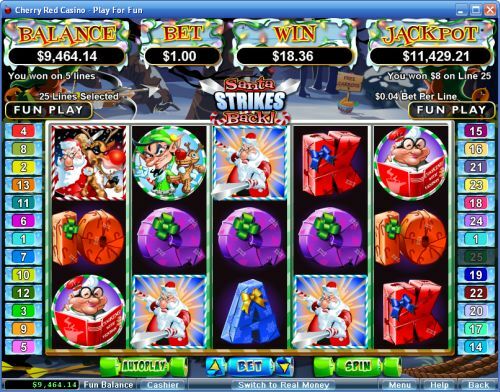 With all of this and much more, Santa Strikes Back is a gift from RTG to the slots player. You can play it by signing up and making a deposit at Bovada! Can players from the United States play the Santa Strikes Back video slot? Yes, players who are based in the United States of America can play the Santa Strikes Back online slot game for real money at Bovada. How do I win the Santa Strikes Back progressive jackpot? To win the Santa Strikes Back progressive jackpot, you must line 5 Santa wild symbols on any payline. Can I play a free Flash game of the Santa Strikes Back slot machine? Unfortunately, Realtime Gaming does not offer too many of its slots in Instant Play format. The Santa Strikes Back X-Mas slot is not one of the games currently available. If you would like to play a Christmas themed video slot in your browser, we recommend you play the Winter Wonders video slot at Bovada.